We made stops at a brewery (Renegade), and whisky distillery (Stranahan’s– loved it!). Our day of indulgence also included a delicious brunch and a super-authentic Mexican restaurant for dinner (the kind we don’t have in Boston). Mariachi music was awesome! The next morning, I worked some of Saturday off with a run around Washington Park. Good spot for doing just that! Afterwards, we headed out to Aspen-Snowmass, 3.5 hours west of Denver. We weren’t alone on the road on this holiday weekend! We loved walking around Aspen in the evening, with dinner at White House Tavern to top it off. Yesterday, we hiked in the Maroon Bells area, just outside of Aspen. The surrounding Maroon Peak towers over a breathtaking 14k feet, and our hike started at roughly 10k. Views were worth some minor struggles with elevation! Maroon Bells are also known as the “The Deadly Bells” due to the “downsloping, loose, rotten and unstable” rock that “kill without warning”. We had no issues, but opted for a shorter hike to Crater Lake as opposed to a longer hike into the Maroon-Snowmass Wilderness. 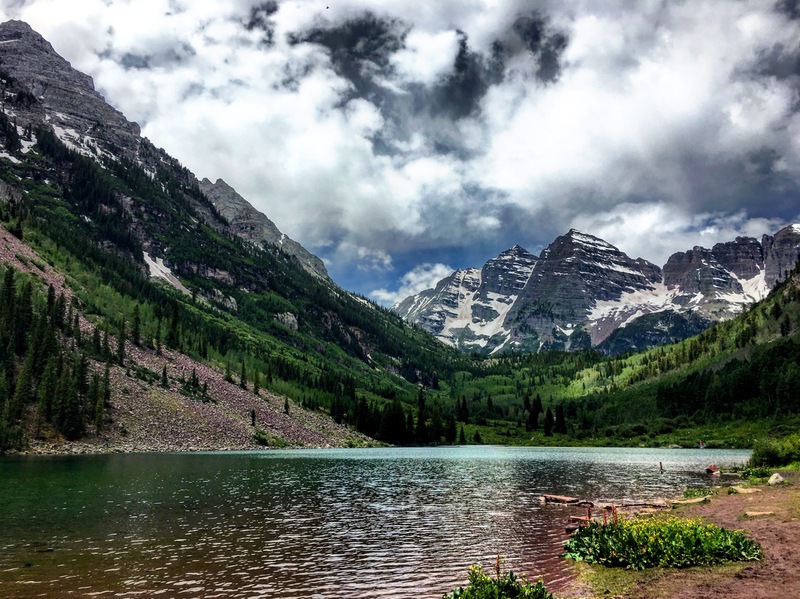 If you’re curious, here is a great guide to Maroon Bells recreational area and other hikes in the beautiful state of Colorado. We are off on another hike today before road-tripping back to Denver for some fireworks and other 4th of July things. Hope you have a great day with friends & family!! Wonderful images. Happy 4th of July from over here in the UK. Happy 4th Jane. Enjoy your holiday! Happy 4th of July to you! Great pictures, hiking there must be amazing. Awesome, Jane! Sounds like a lot of fun. Colorado is a beautiful state, and think you’re only seeing a glimpse of it! I dunno about you but after finding the mountains I couldn’t go back. Besides living and training at elevation is such a built in bonus! I agree! I think it would be hard living away from the ocean now that I am used to that- but nothing like the mountains! Hope you had a fun 4th! Oh yeah- and elevation was a bit challenging, but I can only imagine how beneficial it would be to train up here! This is beautiful! Colorado is for sure my favorite vacation place. Previous Previous post: New Favorite Gear: Jaybird Headphones GIVEAWAY!